The model - this is one of five BACo bodied AEC Regent Mk Vs announced by APEC in early December 2018. Not being licensed products they carry no fleetnames or logos. 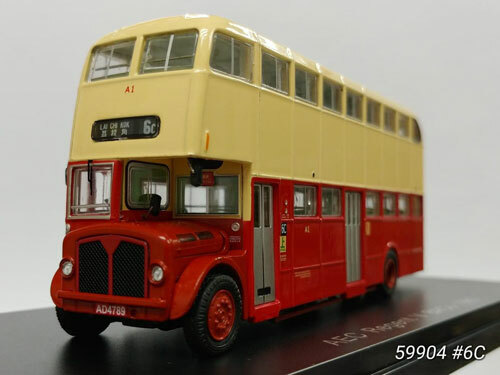 The bus - Kowloon Motor Bus purchased it's first 30 AEC Regent Mk Vs in 1963, these being over 34ft in length - at the time the largest double-deck bus in the world! These were acquired in an attempt to deal with the ever-increasing passenger demand. Previously, the company had to rely on standard sized British buses. These buses could carry 110 passengers. They were originally fitted with sliding gates, but these were soon replaced with platform doors. KMB rebuilt the entire class during 1980-82, thus making them suitable for one man operation. The front entrance was moved forward and reduced to single width and the rear platform entrance/exit was moved to the centre, as double width doors and a centre staircase. The models represent the buses after this rebuilding exercise. AD4789 was first registered on 21st January 1963 and was withdrawn in 1981.